Peter MacCallum Cancer Centre (Peter Mac) announced it launched a new online portal in an effort to boost community engagement. Launched late last month in partnership with the Icon Agency, the site became live just in time for the hospital’s new residence at the Victorian Comprehensive Cancer Centre building. It offers Peter Mac’s community of patients, researchers and health practitioners better design, structure, content and navigation, all accessible across desktop, tablet and smartphone devices compared to the previous platform. Peter Mac also developed the new website with comprehensive stakeholder workshops and contributions from right across the organisation, Macvean claimed. According to Macvean, the aim of Peter Mac is to provide the world’s best cancer care, so engaging effectively with the community via a channel such as an effective digital platform is key to delivering this core outcome. For patients and carers, this includes providing information in a way that’s easy to access and understand to empower those affected by cancer with a sense of control, he said. But the rollout was not without its challenges. Macvean highlighted Peter Mac had a fixed, tight timeline to work within, and to deliver the website to coincide with the big move to the new building in Parkville. “This meant we had to get a huge amount of work done quickly and without compromise, which demanded great teamwork with the agency and across the organisation, flexibility and decisiveness at key project milestones,” he said. 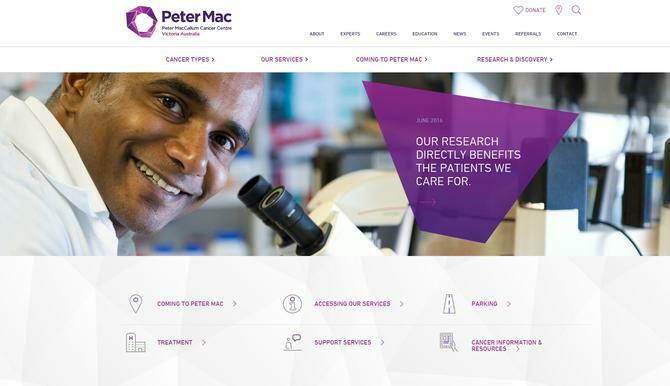 Macvean is confident the new website provides a flexible platform to support Peter Mac’s services in cancer care, research, education and prevention into the future. “The benefits are huge and varied, including better user experience, making it easier for patients and carers to find the information they need, enhancing research, attracting the best people to Peter Mac, and generally improving awareness of the extraordinary care and research taking place within Peter Mac every single day,” he concluded. ​Are customers connecting with your sustainability message?